These are just a small portion of the striking tweets with images* about the protests in Hong from Sunday through mid-Monday. Hong Kong—which, with its 7 million people, is just a tiny corner of China—can expect no quarter from Beijing over its fight for democracy. *Images may not appear if you are viewing this post through a reader. See the post here. Yesterday while I walked around outside in a drizzle, I turned around and noticed something which surprised me. The rainbow didn't strike me as remarkable except in one way—it had been a while since I had last seen a rainbow. 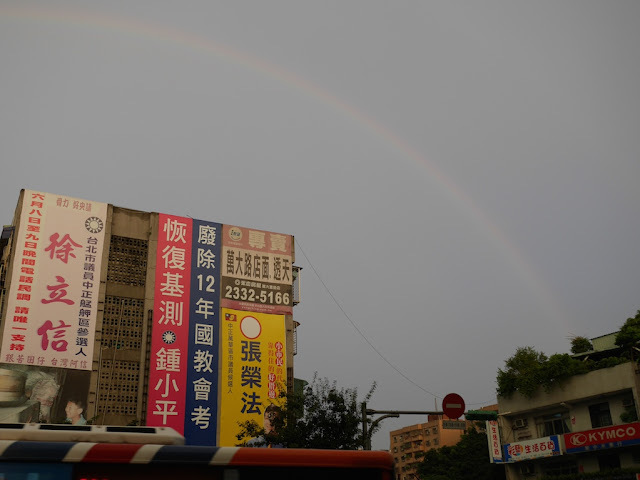 In a post displaying the artificial rainbow I saw in Hengyang, I mentioned I couldn't remember having ever seen a genuine rainbow in China and wondered if pollution or tall buildings were significant factors. I now see that 15 years ago two scientists presented hypotheses for how pollution may have caused a decrease of rainbow sightings in Seoul, South Korea, but they don't claim to have an answer. Whatever the case, I appreciated the rainbow. 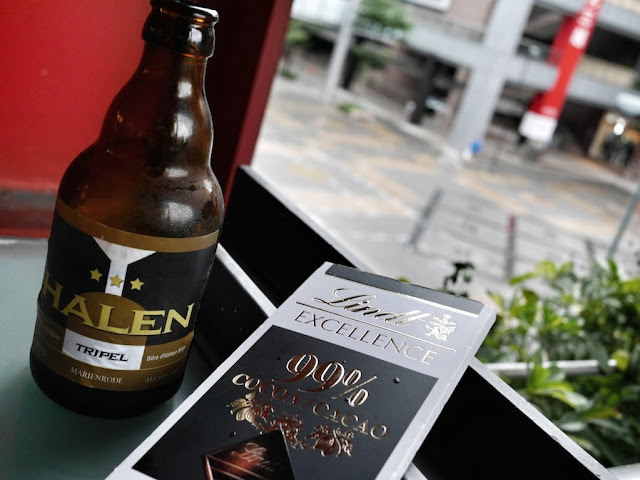 Swiss chocolate with too much cocoa pairs excellently with Belgian beer with too much alcohol. 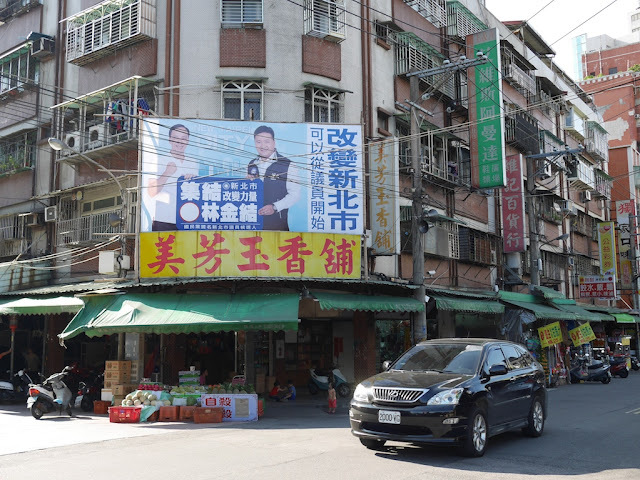 In the Tucheng District of New Taipei City I recently saw a small part of Taiwan's democracy in action. At one location people busily worked for an election campaign. Lin Jinjie (林金結), a member of Taiwan's Kuomintang party, is running for the position of councilor in the New Taipei City Council. 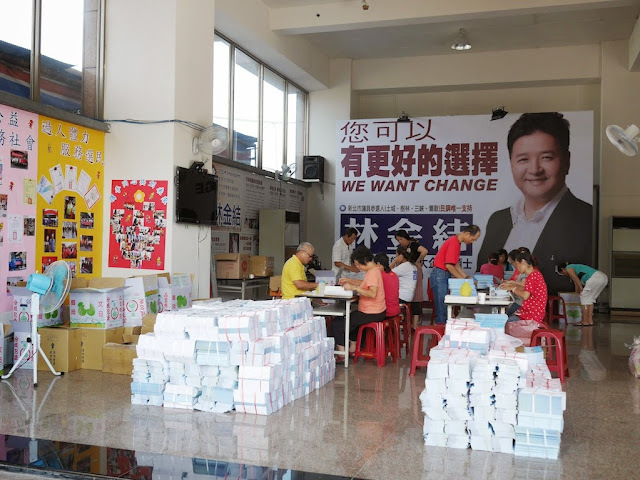 As I walked around Tucheng, I saw some of Lin's campaign signs. Most seemed run-of-the-mill. One sign campaign sign stood out though. Yes, that is Lin with U.S. President Barack Obama. And the sign makes it clear both of them are full of hope for change. 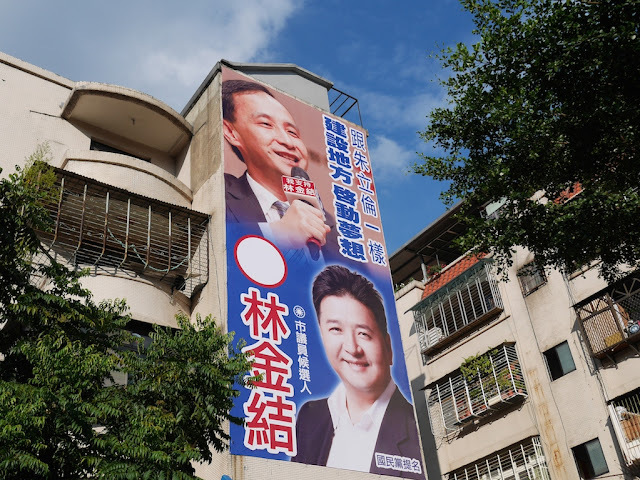 During earlier primary elections some questioned Lin's use of Barack Obama's image and suggested it improperly implied Obama supported Lin or may raise copyright issues (see articles in Chinese here and here). Others commented on the prominent use of English on the sign. Despite the criticism, at least the above sign remains and an image of the sign posted on what appears to be Lin's Facebook page remains as well. 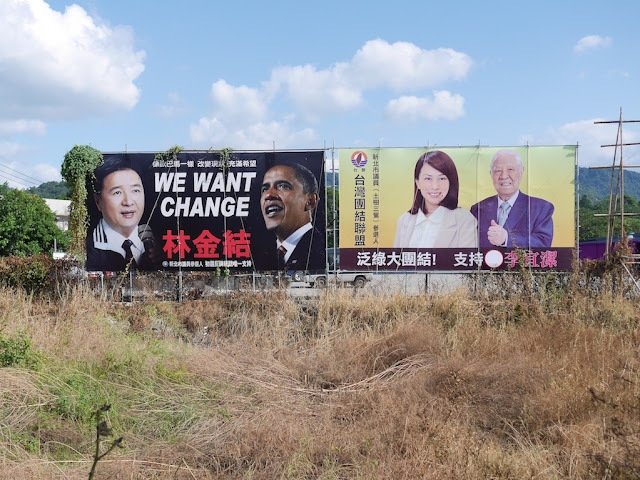 Whatever its merits, that a Taiwanese political campaign believes it could be helpful to reference Obama says something about Taiwan and speaks to America's potential soft power as well. 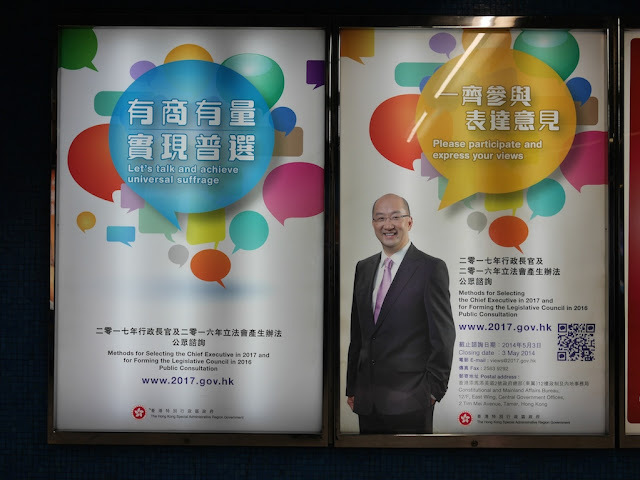 On a related note, I have seen Barack Obama's image used for commercial purposes in mainland China. But due to differences in political systems and cultures, I doubt I will be seeing any similar Obama-themed political-campaign signs there anytime soon. But we here in Taiwan understand that no amount of false promises are enough to sate a people's desire for "FREEDOMMMMMMM". So people and unicorns of Scotland on Thursday vote "YES". 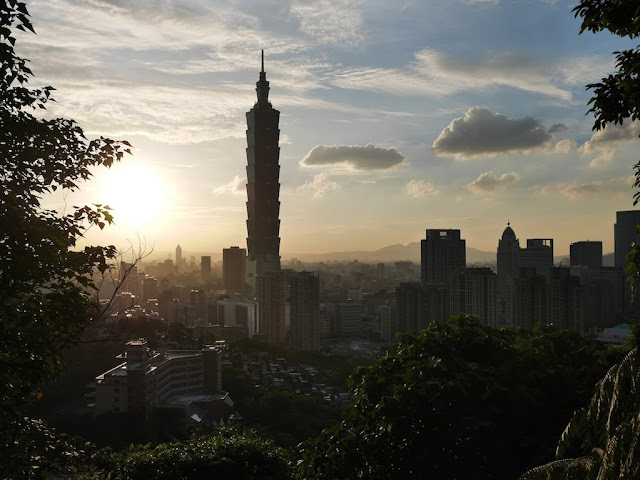 NMA's advice may more reflect its views regarding Taiwan than any deeply held beliefs about Scotland's specific situation, which differs in many key respects. I am not at all convinced that "freedom" per se will have taken a blow if Scotland remains part of the United Kingdom. There are sacrifices to be made when living in a political structure of any size, and there are reasonable arguments that people in Scotland will enjoy more overall freedom as a part of the United Kingdom. Whatever the best choice may be for Scotland, the people are now able to freely express themselves and vote on an important part of their future. And whatever the result, the status quo will have been changed, and the Scottish people will maintain many significant freedoms. Even if you find the above scene mundane, you may be surprised by who makes an appearance on one of the political campaign signs in this area. More on that and other nearby indications of democracy are on the way. 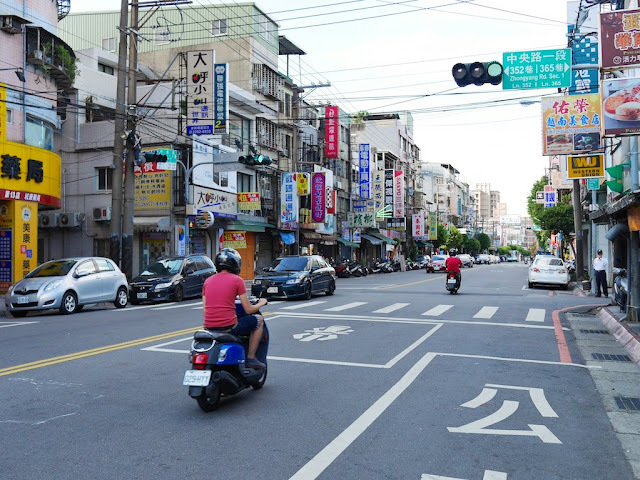 Despite where its leash was anchored, I doubted it would later have an experience like another dog I saw in Hengyang: one running in front of a motorbike. 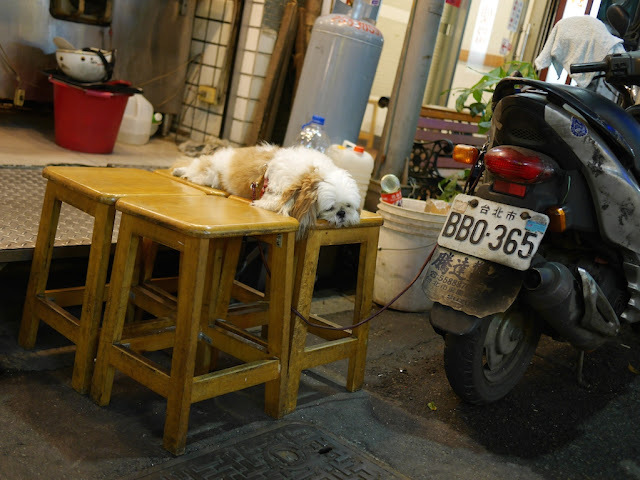 These two scenes are my way of saying I am in Taiwan at the moment. More soon . 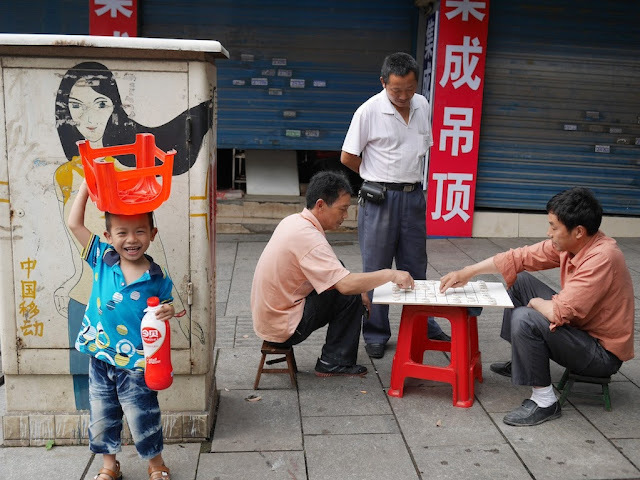 . .
A couple of months ago, I posted two more photos of people playing xiangqi (Chinese chess) in China. 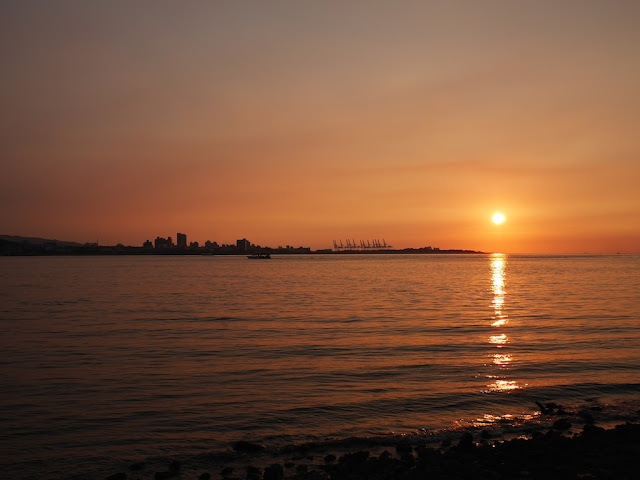 There was a third photo I considered posting, but I refrained because of the photo's similarity to another. In a policy that appears aimed at soothing violent ethnic tensions in the west of China, officials in the region of Xinjiang are offering cash and other financial incentives to encourage marriages between minorities and Han, the country’s dominant ethnic group. Why do they think this could this help? He called such marriages “positive energy” and a means by which Xinjiang can realize the “Chinese Dream,” an amorphous term popularized by President Xi Jinping. Communist officials have long promoted popular tales of mixed marriages to paper over ethnic conflicts. 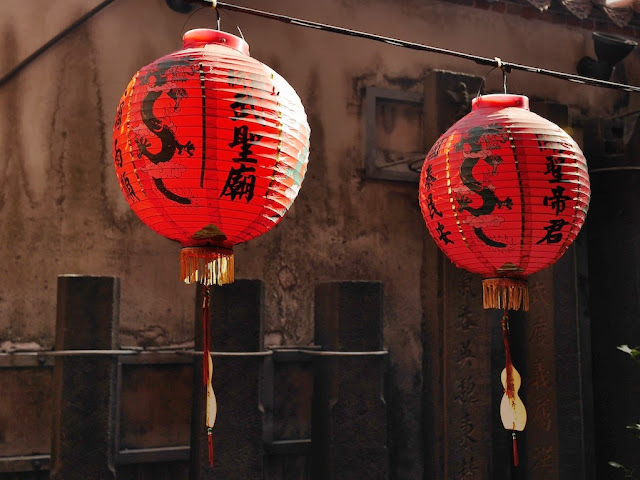 Many Han talk of how the Manchus from the northeastern forests, who conquered China to establish the Qing dynasty, eventually adopted Han customs and intermarried, citing this as an example of how Han Chinese civilization inevitably absorbs and assimilates other ethnicities. As a thought experiment to tease apart some issues and add a different perspective, I tried to imagine the response if a minority in the US, a country with its own history of ethnic and racial tensions, was told by the government that one way to achieve the American dream was to marry a White American and that they would be compensated for doing so. 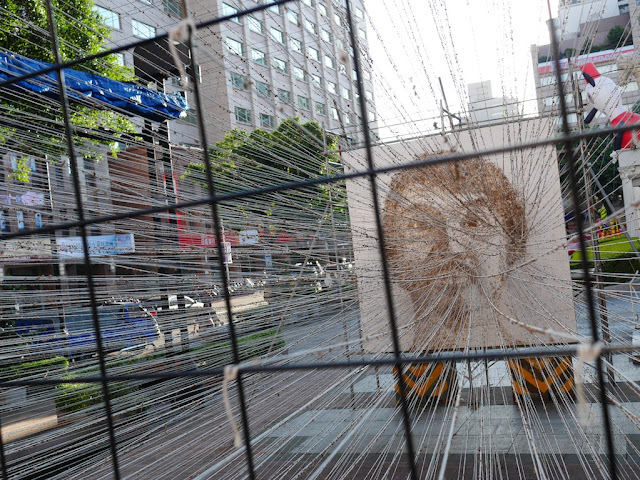 Or what would China think if Han Chinese in the US were specifically targeted in this way? Other thought experiments, even more unlikely to occur in the real world, are also floating through my mind. Most of all, though, I would like to hear the real unfiltered views of some Chinese citizens—in particular, the Uighurs in Cherchen Country who are the targets of the trial policy. 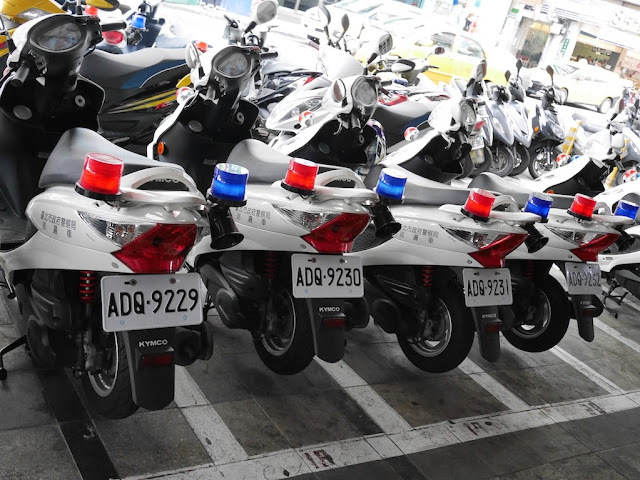 Details of the policy and mention of other related policies can be found in Wong's piece here. 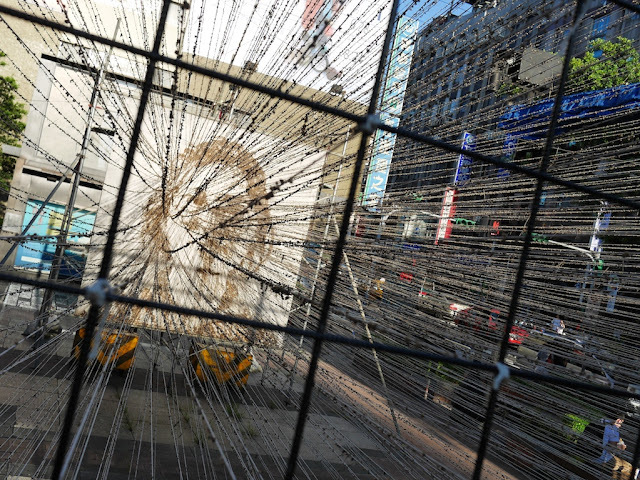 In the near future, the protests will achieve nothing, said Brian Fong Chi-hang, a political science scholar at the Hong Kong Institute of Education and a supporter of the democracy movement. But leaders of the movement expect to wage a protracted struggle nonetheless. [T]housands of people gathered in intermittent rain to protest a decision by China’s legislature to put firm restrictions on a plan to expand the franchise to allow all adults in the territory to vote for their leader, the chief executive. 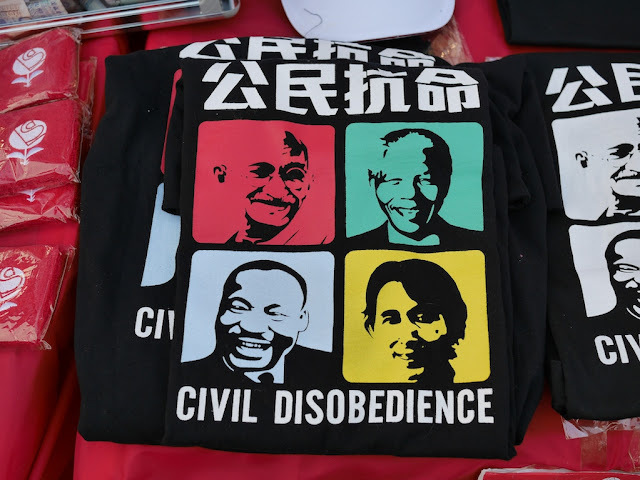 The demonstrators, many of whom wore headbands emblazoned with the Chinese characters for “civil disobedience,” said they drew inspiration from thinkers and practitioners of nonviolent protest, including Henry David Thoreau, Gandhi, Nelson Mandela and Dr. King. 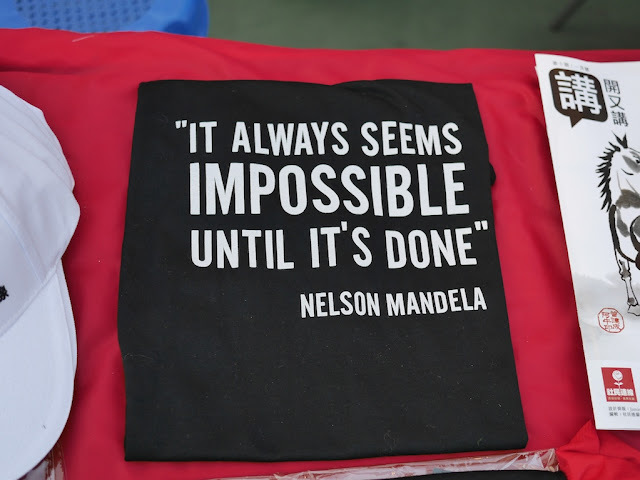 And this reminds me of something else I saw this past January: shirts for sale at Hong Kong's Lunar New Year Fair pro-democracy booths. It wouldn't surprise me if the shirts are available again at next year's fairs.